NFC Student ID Cards Launch in Apple’s Wallet, Though Progress Remains Slow for Apple to Add Nonbank NFC Applications | NFC Times – Near Field Communication and all contactless technology. Duke University is one of three campuses in the U.S. that launched NFC student ID applications in Apple's Wallet Tuesday, as planned. Among uses for the mobile ID cards are enabling students to enter their dorm rooms and pay for purchases with a closed-loop payments account. 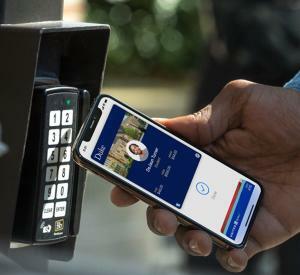 NFC TIMES Exclusive Insight –Three U.S. universities Tuesday launched NFC-enabled ID cards in Apple’s Wallet, with Apple confirming that only three more U.S. campuses are planning to enable campus ID cards in Wallet by the end of the year. The relatively modest rollouts of NFC-enabled student ID this year, which Apple originally announced in June at its Worldwide Developers Conference, are part of the tech giant’s strategy to increase the variety of NFC applications for its devices. All of the universities will use campus credentialing technology from U.S.-based vendor Blackboard, and the ID cards–which will support both access control and closed-loop payments–are to be stored on the secure elements in iPhones and Apple Watches running the requisite OS. But Apple is not opening up its secure elements to third-party developers with this campus ID card program. Article has about 1070 words.